The Barcoding Facility for Organisms and Tissues of Policy Concern (BopCo) provides identifications of policy concern organisms or derived tissues upon request. Alternatively, BopCo connects individuals with taxonomic experts who possess the required know-how and means to identify the sample(s), and who can provide background information on the concerned organisms. Morphological species traits, DNA barcoding and, if needed or relevant, other DNA-based technologies are being used, alone or in combination, to provide reliable taxonomic identifications. A prerequisite to use DNA barcoding is the availability of comprehensive and reliable reference barcode libraries. Therefore, BopCo also contributes to populating DNA barcode databases with sequences of taxa of policy concern. To this end, BopCo produces new DNA barcodes (broad sense, i.e. not only COI), either at its own initiative or in collaboration with research institutes, governmental organisations, universities and others. Instead of developing a separate web portal, the barcode sequences produced by BopCo, as well as the associated metadata is made available via the Barcode Of Life Data Systems (BOLD Systems) and GenBank database platforms, from where the sequences can be downloaded for consultation and analysis. 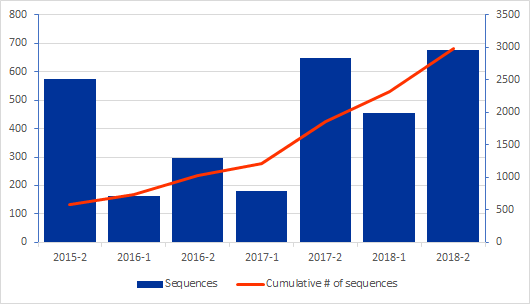 The graph on the right shows the number of sequences produced per half year (blue bars) and the cumulative number of sequences produced since the start of BopCo in 2015 (red line). Sequences that have been made publicly available can be found in the respective publications, on BOLD or on GenBank. More information can also be found on the respective project pages through the BopCo website.